We progressives love to invoke the Holy Spirit in our efforts to move the church forward on various fronts. Until now, this was purely speculative. Yesterday, the Holy Spirit visited the House of Deputies. 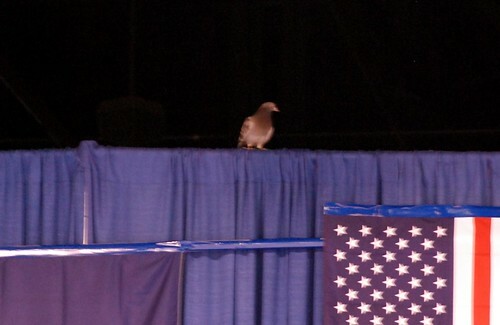 She is shown here, perched just above the flag display behind the dais. Apparently this man from the Committee on Dispatch of Business, who was seated just below the above referenced bird, believes that he may have been chosen for some high office. 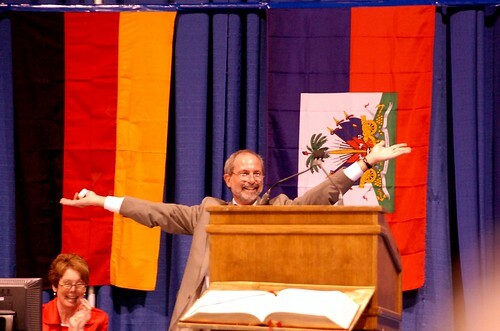 Our next Presiding Bishop? You can see these photos, and more, here.